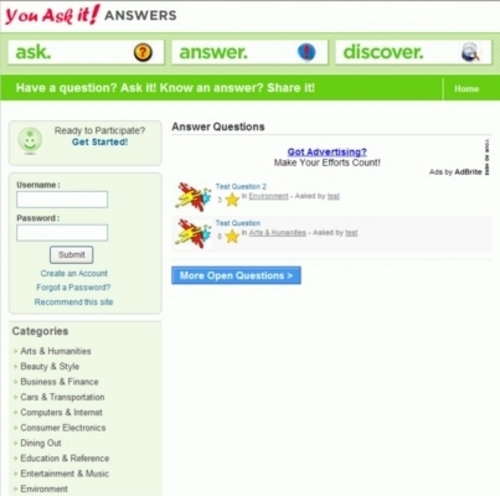 Yahoo Answers Question Answer Script provides the platform for everyone who wants to create website such that visitors can ask Question and Answer the question posted on the website. Along with asking & answering questions visitors can email the questions to their friends, Bookmark the questions, off course give the THUMSUP or THUMPS DOWN to answers posted on the Question. Best Answer facility is also there. Question Answer Script is really a convincing platform to webmaster to create the niche or global website for their online empire. Question Answer Script is really liked by those who want to make money online. For any webmaster, the most tedious work is to continuously increase the content about the topic! But this problem is solved with the Question Answer Script as visitors themselves Post question and answer them thus the diverse content on your niche is generated on your website. And this traffic can be easily monetized by using advertisement through out website. Front End features These features are available to all the visitors visiting your website.  Bookmarks to Digg and other Social Networking sites.  Allowed Domain Sites listed in allowed domains links will be converted in hyperlink.  Change all the Custom Text in your Own Local Language.  Manage the Point System. Its NOT the script on the image.